Dogs that are raised with another dog in the family can be a disappointment to owners when they fail to measure up to expectations based on the first dog, or behave unacceptably. This is because 'second' dogs often have a stronger bond with the other dogs in the household than with their owners. The lack of good relationship with owners can mean that the dog isn't as sociable as they would like, doesn't listen to requests, and gets into trouble through acting independently. If a puppy is raised with dogs and people, it will naturally choose to play with the other dogs as they are so much better a puppy games and, hence, more fun. The puppy will also understand the other dogs’ body language and behaviour more easily than that of the humans and so they will spend more time in the company of the other dogs and learn to enjoy being with them more. If the bond between the puppy and the other dog(s) is strong, the puppy may fail to develop any sort of meaningful relationship with the owners, especially if the owners are busy and don’t put much effort into play and training. Owners often say ‘the puppy doesn’t need training as he just copies the other dogs’. They often don’t realise how little relationship they have with their puppy until it becomes mature and problems develop. Who would your dog choose? To test if your dog is more bonded to your other dogs than you, arrange for someone to take your dog to the far side of a large field and wait there for 5 minutes. Before they return, arrange for your dog to be tied to the fence at the other end of the field. You then need to stand about 20 metres from this dog on the same fence line. The person with the dog being tested then walks towards you down the centre line keeping the lead as loose as possible. As they get closer, the dog being tested will choose who to greet first by walking towards them (the handler should allow this). Does he choose you or other other dog? If he chooses the other dog, he has a stronger relationship with that dog than with you. Before you try to solve any behaviour problems your ‘second dog’ may have, it is important to establish a good relationship with him. Building a bond with a ‘second dog’ can be difficult so expect him to be quite distant and aloof at first. It won't be easy if your dog is already adult, but it can be done. You will need to separate your 'second' dog from others for about 6 months – 1 year (depending on age and state of your relationship) using stair gates to keep them apart, and teach him to play with toys with you, learn from you, have fun with you, and feel supported by you when the other dogs are not around. 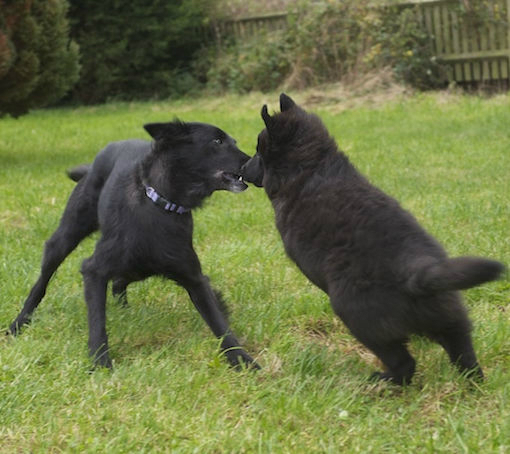 The dogs can be together several times a day to maintain their relationship, but they shouldn’t be allowed to play together and it shouldn’t be for too long. Tackling behaviour problems is always much easier if you have a good relationship with your dog. Building a good relationship with a ‘second dog’ takes time and energy so it probably best to concentrate on this at first until you see signs of your dog starting to enjoy being with you. Once your dog will choose you over the other dogs, it is time to start working on behaviour problems.